Exercise 1.2: Explain how a device which, upon input of one of two non-orthogonal quantum states $\left|\psi\right>$ or $\left|\phi\right>$ correctly identified the state, could be used to build a device which cloned the states $\left|\psi\right>$ and $\left|\phi\right>$, in violation of the no-cloning theorem. Conversely, explain how a device for cloning could be used to distinguish non-orthogonal quantum states. The first part seems fairly straightforward to me : once the state has been identified as $|\psi\rangle$ or $|\phi\rangle$, just prepare an identical state through whatever means we have available, effectively cloning the original state. However, the way the exercise is worded makes me think that there must be some deterministic way of distinguishing between $|\psi\rangle$ and $|\phi\rangle$ given a cloning machine. Is this indeed the case? That's the way that I would initially go about answering the question. There are, however, a few tweaks you could make. As you point out, the annoying feature is that you can never be definitive about having the state $|\psi\rangle$. There are a couple of ways that you might avoid that pitfall. The first option is to have two different measurement bases that you pick between. The first is as you specified. The second is the complementary view where you use $(|\phi\rangle,|\phi'\rangle)$. The second option is to introduce a POVM. (I don't have my copy of Nielsen and Chuang to hand, and don't remember if they've been introduced at this point.) POVMs can have more than 2 measurement operators, and are often quite good at saying "the state was definitely not $|x\rangle$", so you could make one operator that says "the state definitely was not $|\psi\rangle$", another that says "definitely not $|\phi\rangle$" and a third just for the sake of completeness. Both options are variants on a theme, and technically you might still have to run both forever before you get a definitive answer, but the expected number of trials is finite. You can actually pick a better measurement basis than the one you described so that you can come to a conclusion faster (but certainly does not give you a definitive answer). Try to think about the two states $|\psi\rangle$ and $|\phi\rangle$ on the Bloch sphere. You can always find a plane passing through both points and the centre of the sphere. On this plane, there is a circle, with two points corresponding to the two states. Draw lines joining these points to the centre. Next, construct a diameter of the circle which makes equal angles with the two lines you've just drawn. This would define the measurement basis that tells you absolutely nothing about which of the two states you have. But, if you construct the diameter that is perpendicular to that line, this is the one that, at least in a single shot, has the maximum probability of distinguishing between the two states. Here's a picture. 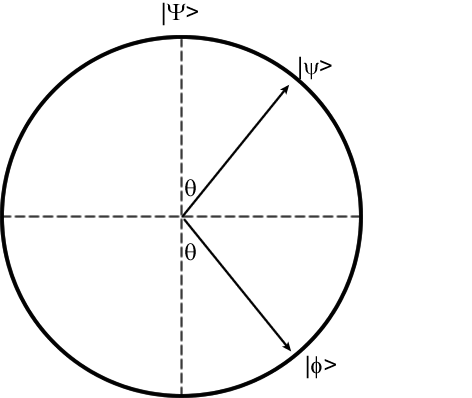 $|\Psi\rangle$ is one of the two basis states that you want for the measurement, and remember that the angle $\theta$ can be related to $|\langle\psi|\phi\rangle|$. It might be worth then calculating if you have $k$ copies of each state, whether a joint measurement constructed in this way can perform better than the individual measurement repeated $k$ times. Not the answer you're looking for? Browse other questions tagged quantum-state no-cloning-theorem or ask your own question. How to translate matrix back into Dirac notation?